I would say today was pretty fun. The group got to split up and explore San Sebastian. I went off with the girls again, as Darien is just getting worse by the minute. 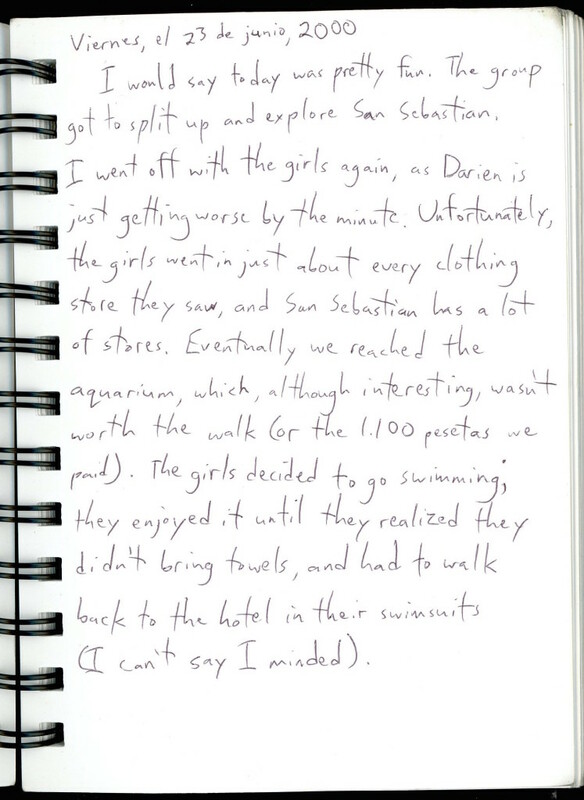 Unfortunately, the girls went in just about every clothing store they saw, and San Sebastian has a lot of stores. Eventually we reached the aquarium, which, although interesting, wasn’t worth the walk (or the 1.100 pesetas we paid). The girls decided to go swimming; they enjoyed it until they realized they didn’t bring towels, and had to walk back to the hotel in their swimsuits (I can’t say I minded). Next Next post: This thing is a thing!